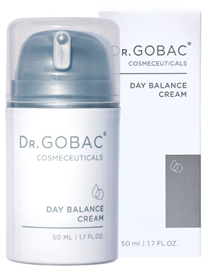 DR. GOBAC® DAY BALANCE CREAM is deeply rehydrating and anti-ageing for a healthy glowing skin. This complex formulation is carefully balanced to rehabilitate the skin deep down. It repairs damage caused by free radicals. Elasticity and tonicity is improved, resulting in firmer, younger-looking skin. Active ingredients protect and nourish the skin, combating the visible signs of ageing. Every morning apply to the face and neck after thorough cleansing and serum application. Massage gently in an upwards circular motion.